Since the Great Recession began in December 2007, the United States federal government has spent over $1.2 trillion on direct stimulus measures.1 The positive effects of this spending have been obvious: cars have been purchased, teachers have remained employed, and infrastructure has been built. However, job creation and economic growth are affected not only by the easily observed results of policy, but also by the less-obvious results, many of which negatively impact the economy. What is more, these negative effects can last long after current policy makers have left office. To the extent that these less-conspicuous results are ignored or underestimated, policy is biased in favor of government spending. This paper examines one of the most important unseen effects of fiscal policy: crowding out. The resources that government spends must be obtained from the private sector through borrowing or taxation.3 If the private sector would have otherwise employed these resources, then government spending creates a cost that must be weighed against whatever benefit comes from spending. How Does Crowding Out Happen? Government borrowing can crowd out private spending and investment in a number of ways. Consider first the most-extreme case in which government borrowing has the exact same effect on the economy as government taxation. Borrowed money must eventually be paid back. And because of this, some taxpayers may view government borrowing as delayed taxation. If so, these taxpayers will spend less today to save in anticipation of paying higher taxes in the future. Accordingly, deficit-financed spending is equivalent totax-financed spending: it induces people to spend less and save more.11 In the extreme version of this theory, there is 100 percent crowding out: households and firms reduce their current consumption and investment by the full amount of the borrowed money. In this sense, government cannot stimulate the economy by borrowing and spending. Looking forward, the current government response to the crisis seems likely to lead to a permanently higher level of government spending. Consider figure 1, reproduced from Congressional Budget Office (CBO) reports issued in June 2009 and August 2010. As is the Keynesian prescription, federal spending as a share of Gross Domestic Product (GDP) increased markedly in response to the Great Recession; it rose from less than 19 percent in 2007 to about 25 percent in 2009. 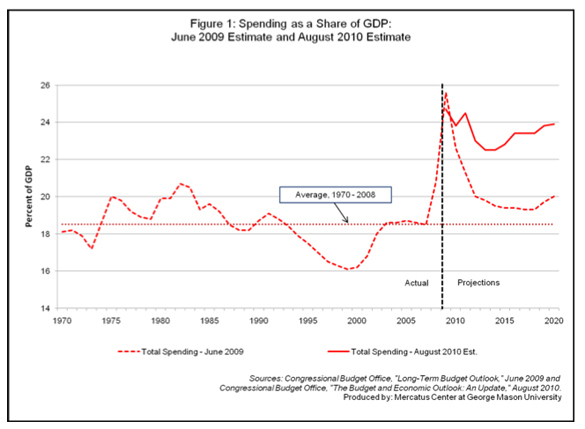 In keeping with Keynesian policy recommendations, the spending was initially projected to be temporary. In its 2009 estimate, the CBO projected that spending as a share of GDP would fall back down to near pre-recession levels (though not down to the 1970–2008 average). One year later, however, the CBO is now projecting that spending as a share of GDP will remain significantly above its pre-recessionary level for the foreseeable future. Given the tendency for temporary stimulus spending to become permanent stimulus spending, what can we say about the net effects of stimulus? 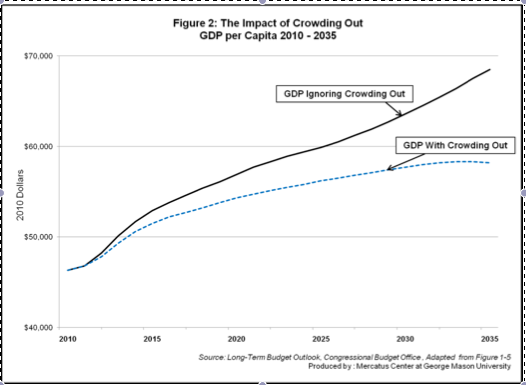 The CBO has also estimated the cost of crowding out over the long run (see figure 2). By their estimate, crowding out will reduce inflation-adjusted gross domestic product per person by 6 percent in 2025 and by 15 percent in 2035.25 For the economy at large, this means an economic cost of $1.2 trillion in real lost economic activity in the year 2025, more than the cost of the wars in Iraq and Afghanistan combined. For individuals, this will mean lower incomes and less opportunity. This principle should also be applied to estimates performed by Congress’s economic forecasting organizations: the Congressional Budget Office and the Joint Committee on Taxation (JCT). Under certain circumstances—as when they have received a specific request from Congress—these organizations account for crowding out in their estimates. (CBO’s estimate, cited in figure 1 above, is a case in point.) In estimates of typical legislation, however, they ignore the crowding effects of spending. Moreover, these organizations are required by law to estimate the cost of a piece of legislation, as it is written.28 This means that if a program is designed to be temporary, it must be scored as such, even though many temporary programs tend to become permanent. In this way, the true cost of legislation is systematically underestimated, biasing lawmakers to favor more spending. To provide a more complete perspective of the impact of spending, CBO and JCT should account for crowding out in their typical analyses. Ideally, these analyses would also include an additional estimate accounting for the possibility that temporary projects might become permanent. This will encourage lawmakers to account for both the seen and the unseen effects of their actions. 1. Bailout Tracker, August 2010. 2. The Obama administration claims that each additional dollar of federal stimulus spending can yield up to $1.57 in economic activity. See Romer and Bernstein (2009), p. 12. Harvard economists Robert Barro and Charles Redlick (2010, p. 1), on the other hand, find that one dollar in spending yields only $0.4 to $0.7 in economic activity. UCSD’s Valerie Ramey (2009) estimates the effect is somewhere between these two estimates: $0.6 to $1.1. 3.In practice, monetary policy offers another way to obtain revenue: if government can print money or somehow increase the velocity of money, it can finance its expenditures that way. We ignore these possibilities in the current paper. 4. For a Keynesian-oriented treatment of taxation, see Romer and Romer (2010). 6. International Monetary Fund, 2010. 7. Here we focus of the crowding-out effects of deficit-financed government spending. This is the most common conception of the term. Increasingly, however, economists have come to use the term to refer to various effects of government intervention in the private economy. One example is the crowding-out of private employment by public employment. See Feldman (2006) or Malley and Moutos (1996 and 1998). Another example is the crowding out of private charitable giving by government spending on social programs. See Payne (1998). For a recent account of crowding out as it affects employment, R&D, and sales, see Cohen, Coval, and Malloy (2010). 8. Cowen and Tabarrok, 2010. 9. Spencer and Yohe, 1970. 10. Keynes,  1963, emphasis original. 11. The idea can be traced back to the classical economist, David Ricardo. Because it implies that deficit-financed spending is equivalent to tax-financed spending, the theory is known as the Ricardian equivalence theorem. In its modern incarnation, it is generally associated with Robert Barro. See Barro (1974). 13. Mankiw, 2008, pp. 589-91. 15. Snowdon and Vane, 2005. 16. See DeLong’s comments above. More generally, see Center for American Progress, 2009. 17. Nobel Laureate Milton Friedman famously stated: “Nothing is so permanent as a temporary government program.” For an empirical examination of the growth of government spending after crises in the United States, see Holcombe (1993). 18. Church and Mathias, 1973. 19. These figures are drawn from the Office of Management and Budget, 2010. In her farewell address, the Chair of the Council of Economic Advisors, Chrstina Romer, asserted that “$266 billion of additional temporary recovery measures were in the 2011 budget.” See Romer (2010). 20. Sobel and Crowley, 2010. 21. Budget data are calculated from the White House Office of Management and Budget (2010). Economic data are from the U.S. Bureau of Economic Analysis (2010). 22. Buchanan and Wagner,  1999. 24. Mountford and Uhlig, 2008. 25. Congressional Budget Office, the “The Long-Term Budget Outlook,” 2010. 27. For a discussion of the path dependent nature of government growth, see Holcombe (2005). 28. For an examination of CBO’s current cost scoring methodology, see Congressional Budget Office. Background on Cost Estimates. (2010). For a discussion of the JCT methodology, see Joint Committee on Taxation, Joint Committee Revenue Estimation Process (2010). Barro, Robert. "Are Government Bonds Net Worth?" Journal of Political Economy, 1974: 1095-1117. Barro, Robert, and Charles Redlick. "Macroeconomic Effects from Government Purchases and Taxes." Mercatus Center at George Mason University Working Paper, July 2010. Bastiat, Frédéric. Selected Essays on Political Economy. Translated by Seymour Cain. Library of Economics and Liberty,  1995. Buchanan, James, and Richard Wagner. Democracy in Deficit. New York: Academic Press, 1977. Center for American Progress. Progressives and the National Debt: Consequences and Solutions. September 30, 2009. http://www.americanprogress.org/events/2009/09/deficit_event.html (accessed September 1, 2010). Church, Frank, and Charles McC Mathias Jr. Emergency Powers Statutes. Senate Report, Washington, D.C.: U.S. Government Printing Office, 1973. CNNMoney.com. "Bailout Tracker." August 2010. http://money.cnn.com/news/storysupplement/economy/bailouttracker/ . Cohen, Lauren, Joshua Coval, and Christopher Malloy. "Do Powerful Politicians Cause Corporate Downsizing?" National Bureau of Economic Research Working Paper, no. 15839 (2010). Congressional Budget Office. Background on Cost Estimates. http://cbo.gov/costestimates/CEBackground.cfm (accessed August 8, 2010). Congressional Budget Office. "Long-Term Budget Outlook." Washington, D.C. , 2010. Cowen, Tyler, and Alex Tabarrok. Modern Principles of Economics. New York: Worth Publishers, 2010. DeLong, Brad. "The Bush Budget Clown Show." Grasping Reality With Both Hands. February 4, 2008. http://delong.typepad.com/sdj/2008/02/the-bush-budget.html (accessed August 13, 2010). Feldman, Horst. "Government Size and Unemployment: Evidence From Industrial Countries." Public Choice 127 (2006): 451–467. Gale, William. "Budget Deficits." In The New Palgrave Dictionary of Economics, by Steven Durlauf and Lawrence Blume. Palgrave Macmillan, 2008. Holcombe, Randal. "Government Growth in the Twenty-First Century." Policy Challenges and Political Responses: PublicChoice Perspectives on the Post-9/11 World 124, no. 1/2 (2005): 95-114. Holcombe, Randall G. "Are There Ratchets in the Growth of Federal Government Spending." Public Finance Review, 1993.
International Monetary Fund. Navigating the Fiscal Challenges Ahead. Fiscal Monitor Series, Washington, D.C. : IMF, 2010. Joint Committee on Taxation. Joint Committee Revenue Estimation Process. http://www.jct.gov/about- us/revenue-estimating.html (accessed 8 18, 2010). Keynes, John Maynard. The General Theory of Employment, Interest, and Money. New York: Hartcourt, Brace and Company,  1963. Malley, Jim, and Thomas Moutos. "Does Government Employment 'Crowd Out' Private Employment? Evidence from Sweden." Scandenavian Journal of Economics, 1996: 289-302. —. "Government Employment and Unemployment: With One Hand Giveth, The Other Taketh, mimeo." Department of Economics University of Strathclyde ICMM Discussion Paper. no. 47. 1998. Mankiw, Gregory. Principles of Economics. Mason, OH: South-Western Cengage Learning, 2008. Marron, Donald. "Understanding CBO Health Cost Estimates." Backgrounder: Published by the Heritage Foundation, July 2009. Mountford, Andrew, and Harald Uhlig. "What Are the Effects of Fiscal Policy Shocks?" NBER Working Paper, no. 14551 (2008). Office of Management and Budget. Budget of the United States Government, Fiscal Year 2011. Washington, D.C.: U.S. Government Printing Office, 2010. Payne, Abigail. "Does the Government Crowd-Out Private Donations? Evidence from a Sample of Non- Profit Firms." Journal of Public Economics 69 (1998): 323-345. Ramey, Valerie. "Identifying Government Spending Shocks: It's All in the Timing." National Bureau of Economic Research Working Paper No. 15464, October 2009. Romer, Christina. Not My Father's Recession: The Extraordinary Challenges and Policy Respones of the First Twenty Months of the Obama Administration. Washington, D.C.: National Press Club, 2010. Romer, Christina, and David Romer. "The Macroeconomic Effects of Tax Changes: Estimates Based on a New Measure of Fiscal Shocks." American Economic Review 100 (June 2010): 763–801. Romer, Christina, and Jared Bernstein. The Job Impact of the American Recovery and Reinvestment Act. Washington, D.C. : Council of Economic Advisors, 2009. Romer, David. Advanced Macroeconomics. Boston, MA: McGraw-Hill, 2001. Snowdon, Brian, and Howard Vane. Modern Macroeconomics: Its Origins, Development, and Current Statei>. Cheltenham, UK: Edwar Elgar Publishing, 2005. Sobel, Russel, and George Crowley. "Do Intergovernmental Grants Create Ratchets in State and Local Taxes? : Testing the Friedman-Sanford Hypothesis." Mercatus Working Paper, 2010. Spencer, Roger, and William Yohe. "The 'Crowding Out' of Private Expenditures by Fiscal Policy Actions." Federal Reserve Bank of St. Louis, October 1970. Did Stimulus Dollars Hire the Unemployed?